At Dr. Grant's dental office we complete a comprehensive exam when you schedule your first check-up. 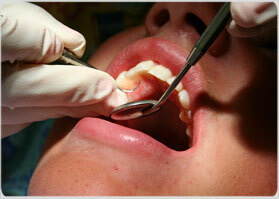 This includes necessary x-rays, a full oral exam, a complete periodontal (gums) exam and oral cancer screening. Dr. Grant's office has a very experienced hygienist with over 30 years of experience and dedication to the dental field. We have a variety of methods to treat gum diseases and bad breath. Upon each and every recall visit your home care instructions are modified and reinforced. Good oral hygiene is important to prevent a variety of dental and medical problems. Recent research has shown that the bacteria present in gum disease are also found in the plaques clogging arteries in people with heart disease. Therefore, a good professional cleaning is essential not only for the health of your teeth, but also for your general well being.